Experts say the bridge collapse in Italy could happen here. TODAY's Jeff Rossen has where you can find a state-by-state list of structurally deficient bridges. 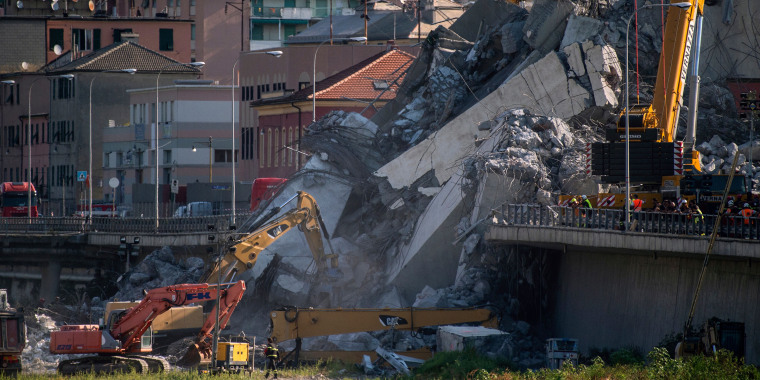 In the wake of a deadly bridge collapse in Italy, many are wondering, could it happen here? Experts say the answer is yes — and just like in Genoa it can happen without warning. Bridges with hidden failures are being used in every single state. Bridge safety concerns: Is your neighborhood structure in danger of crumbling? On TODAY Friday, investigative correspondent Jeff Rossen took an up-close look at what it means when a bridge is in "poor condition." After our story aired, the U.S. Department of Transportation responded to our question regarding why a bridge considered to be in “poor condition” may not be deemed unsafe for public travel. According to a spokesperson, when a bridge is in “poor condition,” it means that one or more of the components of the bridge needs repair, closer monitoring or sometimes weight restrictions. The DOT said any bridge deemed unsafe will be closed. If you want to know which bridges are structurally deficient in your neighborhood, the American Road & Transportation Builders Association has a state-by-state map. To see the full 2018 list and map, go here.